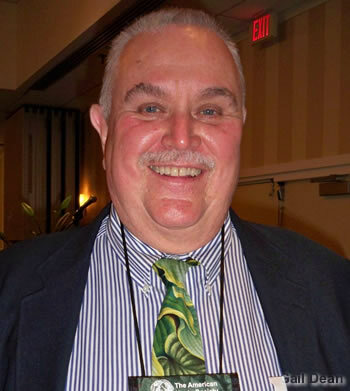 It is truly an honor to be standing before you as the 2013 recipient of the prestigious Alex J. Summers Distinguished Merit Award, and it is especially exciting to receive this award at the convention I had a major role in organizing. This truly is a distinguished group of people that I am honored to become a part of. I wish to acknowledge those previous recipients that are in attendance here. Would you please stand so we can thank you for your service to the society? My involvement in the American Hosta Society began in 1990 and has become a love and passion ever since. I do, however, have to acknowledge my wife, Becki, without whom this journey would not have been possible. It is really a shared award, as she has been at my side through the thick and thin of it all, and has been my unfailing supporter and cheerleader. Thank you, Becki, for your love and support! It is also very rewarding to have our family here to share in this honor. My journey into hostadom began in 1978, when I moved into my first home that didn’t have any landscaping, and I needed plants to “landscape” my yard. 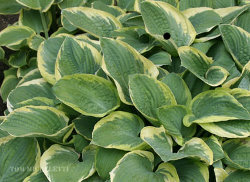 I soon was given the green hosta, H. ‘Lancifolia’, the green with the white margins, ‘Undulata Albomarginata’, and the green with the white center, ‘Undulata’. I had all three! These were easy to grow, carefree plants, that looked good most of the season. Soon thereafter, I began receiving catalogs from Wayside Gardens and others, and quickly realized I didn’t have them all! In 1990, upon reading an ad in Horticulture magazine for the American Hosta Society, I wanted to learn more about these amazing plants and joined. Jim Wilkins was president at the time, and he recently told me I was the only person he knew of that joined because of that ad. That same year I attended my first convention in Minneapolis. There were these two crazy guys walking around with shoulder pads of hosta leaves! As it turned out, they were the co-chairs of the convention, Bob Olson and Roger Koopmans. And all Jack Barta and I could come up with are “cheeseheads”. Upon seeing all the wonderful varieties of hostas available in the gardens, it quickly cemented my love of this beautiful, diverse plant. The collector in me wanted to add to my collection, and I set out to get all of them! As time went on, I realized this wasn’t an option. Even if I could acquire every one, I wouldn’t have room to grow them. Don’t worry Van Wade. I’m not going to be able to compete with your wonderful collection! I’ll just come visit your collection when I have hosta lust. At this first convention is where I discovered the Midwest Regional Hosta Society and promptly joined it. Not having enough hosta immersion, I decided to start a local society in my area. In 1992, I founded the Northern Illinois Hosta Society. In 1986, we moved into our newly built home with an acre of land! More room for hostas! Only it was all sun, not a tree in sight. I quickly planted some trees and became creative with planting of hostas in areas shaded by the house, and other plants, such as tall ornamental grasses. This is when The Hosta Patch began as a garage sale, which quickly infuriated a couple of my neighbors. As a solution, I started selling the plants via mail order. For me, membership in an organization is more than just showing up to events, and I strongly believe in getting involved in organizations to which I belong, in order to offer my services to help make them strong and viable, whether it be volunteering at church, or, in this case, a hosta society. We all know it takes volunteers to make an organization strong and keep it thriving. One of the most difficult tasks, as president of each of the three hosta organizations I have served, was finding people willing to accept a role in serving in various positions. Human nature is to let someone else do the work. That’s not a very healthy option to sustain a volunteer organization. In a room this size, people have many talents that they can use to serve this society. I urge every one of you to step forward and offer your services to help move this great organization forward. Last night we recognized the many individuals that helped make this convention a reality. Without them these two cheeseheads couldn’t have pulled it off. I want to thank them again. The AHS needs you! We cannot continue without people willing to step up and take a role in serving the society. In each issue of The Hosta Journal is a list of volunteer positions. Notice those that are vacant. Please step up and offer to fill one of these positions, or better yet, offer to host a convention. In the many positions I have served over the years, in all levels of the hosta world, my overwhelming desire has been to help make the organization, to which I belong, thrive. I have tried to do this through developing relationships with the people that make up the organization. After all, it is the people that make up the organization. With my involvement in each group, I have met new hosta enthusiasts, individuals with a similar passion for this crazy plant, and a willingness to share their knowledge. Herb Benedict coined the term that the hosta is “The Friendship Plant.” He was right! I have made many “hosta” friends over the years. Some even have become close friends that I visit occasionally, while traveling in their area of the country. We have shown our appreciation to the volunteers that have helped make this convention a success. We have shown our appreciation to the gardeners that have opened their gardens and allowed us to share in their hard work, by giving them a stepping-stone, and a ‘Thank You’. It is in this spirit of appreciation for all that the hosta world has given me that I select Hosta ‘Thank You’ as the Alex J. Summers Distinguished Merit Hosta. I truly appreciate being selected the Alex J Summers Distinguished Merit Award Winner on the 45th anniversary of the American Hosta Society.